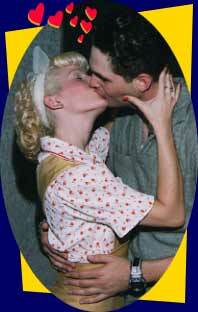 Erik Robison and Sylvia Skylar began dancing together in April of 1997. Their similar interest in reviving the earlier forms of swing dance was the driving force behind their wholehearted investigation into the more traditional swing dances, such as Partnered Charleston, Collegiate Shag, and the Balboa, as well as the more common dance of the 6 and 8 count Lindy Hop. They studied hours of old movies, soundies, and vitaphone shorts and actually had the opportunity to learn first-hand from many of the original dancers from these clips. The more they studied, they realized that there was an entire style of Lindy Hop which seemed to be lost in the modern Lindy movement. It was the style that belonged to the swing dancers from Southern California and more specifically, Hollywood, during the 1930's and the 1940's. Erik and Sylvia fell in love with the style and dedicated themselves completely to its revival. Erik and Sylvia named and trademarked their rendition of this authentic Lindy Hop style "Hollywood Style". Hollywood style refers not to the geographic area of origin, but to the medium from which they learned, old Hollywood and its dancers. Erik and Sylvia's mutual interest in authentic swing dance, and a passion for vintage attire, has sparked a partnership and a reputation that has taken them all across the United States, and abroad, as performers and instructors. They teach regularly at the world famous Derby in Hollywood, and do extensive private instruction and weekend workshops. At the American Lindy Hop Championships, they won first place in the Showcase Division. Their engagements at annual swing camps include Whitsun Tide Camp (Germany), Camp Hollywood, The Battle of the Big Bands (D.C.), Monsters of Swing (Ventura, CA), Jitterbug Jam (Westlake Village, CA), San Francisco Swing Jam, The Virginia State Open, and frequent other invitations. With a purposely traditional, authentic "look", Erik and Sylvia have done photo shoots for Bugle Boy, Vanity Fair with Leonardo DiCaprio, Life Magazine's Year in Pictures, and CD covers for 'Yule Be Swingin', and 'The Swingin'est Sounds Ever Heard'. They were featured dancers in Brian Setzer's 'Jump Jive n' Wail' and Royal Crown Revue's 'Zip Gun Bop' music videos. Their live performances include the Los Angeles Independent Film Festival, wrap parties for ER and The Nanny, and the MTV video music awards. They can be seen dancing in Sony-Tristar's 'The Thirteenth Floor'. They have performed on television shows such as 'Beverly Hills, 90210', 'Everybody Loves Raymond', and 'Ally McBeal'. They have been featured in commercials for Sony, Warner Bros., Disney, and the Grammy Awards.